Despite being in what I hope are the final throes of preparation for the moth field guide, I wanted to post about this before it lost relevancy. A couple of weeks ago I was invited by rare Charitable Research Reserve, a non-profit that manages some 900+ acres outside of Cambridge, Ontario, to come to their site and do a talk and moth night for a group of about a dozen of their volunteers. After some initial waffles (largely due to my shyness and reservations regarding speaking to groups) I decided to accept. I was very glad I did, because I think the evening went quite well. 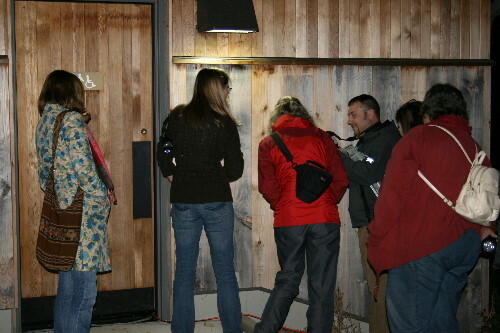 We started out inside, where I gave a powerpoint presentation, an introduction to moths and mothing. I wanted to try to imbue a bit of my passion for moths into my audience, or at the very least foster an appreciation for the insects. My target was 45 minutes to an hour, but going in (and not having done the presentation before) I was simply hoping to reach half an hour. As it turned out, I did fill the full time allotment. Dan, who had joined me for moral support and stood at the back watching, said it was the most nervous he’d ever seen me (I did feel pretty nervous). My friend who works for rare and was the one to extend the invitation, said I didn’t appear nervous at all. So hopefully that’s how all the other people saw me, too! They laughed when I tried a joke, no one fell asleep or looked bored, and one younger girl who looked like she might have been in her teens even kept studious notes through the whole thing. Following the presentation we went out to where I’d set up my moth sheets and lights earlier in the evening. We had two mercury vapour bulbs and a blacklight going, in addition to the two security lights on the side of the building, plus we’d put out some sugar bait to try to draw in some nectar feeders. 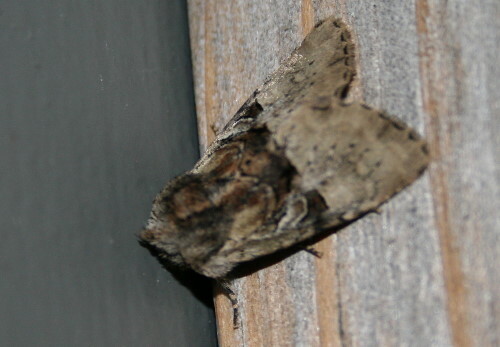 The night was cooler than was ideal, but we still got a good assortment of moths – some 31 species by my tally. 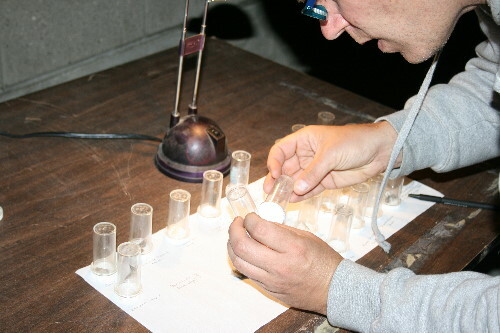 I took my “moth jars” (prescription pill bottles obtained in bulk, never been used for pills) and had folks visit the lights and bait and bring back moths they found. I’d do my best to identify the species (there were only a few I wasn’t certain of, fortunately). As new species were ID’d I set them up on a couple sheets of paper and wrote their common names underneath. People could compare the moth they brought back to those already caught, or simply look at and admire the moths in the jars. I got the impression that the volunteers found the variety interesting, even though they weren’t the flashiest of species – autumn moths tend not to be as bright or wildly shaped as summer moths. This guy was probably the star of the show. 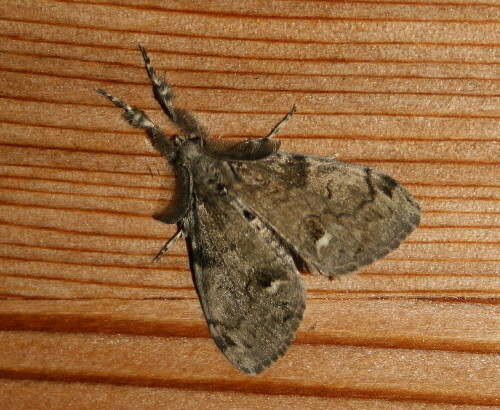 This is a Large Tolype (Tolype velleda), an autumn-flyer that’s related to the common Tent Caterpillar Moth. 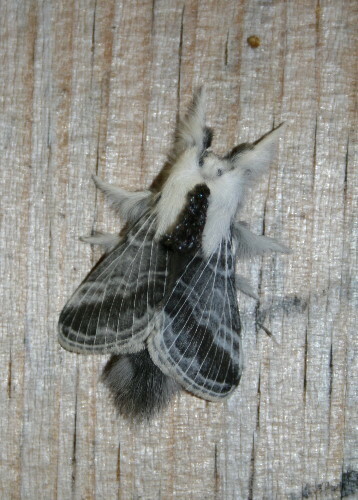 They’re pretty neat-looking moths – all fuzzy with a dark, blue-speckled mohawk down their back – and it happened to be one of the first ones to show up at the lights. I think it set a good tone for the evening! A few of them came in to the lights over the nearly two hours we were out there. One of them landed on the cement walkway, and I picked it up to move it to a safer location. It immediately went into its characteristic defensive posture, curling its legs and abdomen and playing dead. I brought it back to the ID table thinking it would interest the folks there for the few minutes it remained like that, but in fact it stayed curled up for the rest of the evening. The other species to turn up weren’t quite as strange to look at, but were still interesting, I thought. 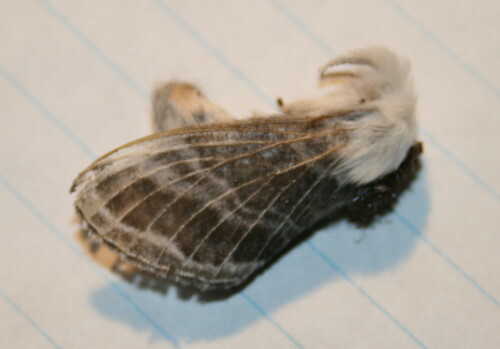 This one is a tussock moth, a group of moths that have fuzzy caterpillars with tufts of long hairs sticking up in patches. Adults all have this deltoid shape, and typically rest with their front legs sticking out like this guy is doing. The tussocks can be a little hard to identify, but I believe this one to be a White-marked Tussock Moth (Orgyia leucostigma). And this last one was probably only appreciated by me at any great level, and that was largely because it’s a relatively uncommon species. It’s a Multicolored Sedgeminer (Meropleon diversicolor), and its caterpillars feed on (you guessed it) sedges. Although I’ve mothed at a few locations now (all of which had some wet areas with sedges), the only place I’ve caught it has been here at Tay Meadows. So it was a good evening, and I think I’ll be less reluctant about doing one again in the future now. :) In fact, rare have indicated they’d like to ask me back again in June (during the peak mothing period), so we can enjoy some of the colourful and amazing moths on show then. I’d look forward to it! Thanks to my friend Julia at rare for making this event happen. That looks like a cool event. 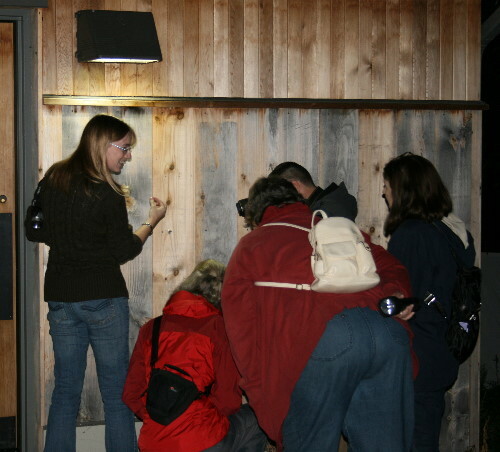 It was a public moth night that shifted me from curious about moths to a practicing moth-er, so maybe your talk and demo will inspire some people to set up their own moth lights. What a cool evening! I’d love to learn more about moths. Beautiful post. Lovely shots.b Congrats on public speaking. It gets better! Thanks for the comments, everyone. It was my desire to share my enthusiasm for these amazing creatures that led me to the moth guide (and what a canful of worms that turned out to be!). It’s great to see others catching the bug! I hope that some of the attendees might be inspired by it, John! There were a couple who seemed quite into it. Just another year and a half, Liza Lee and Barbara, and there’ll be a new guide out to help you! :) There’re actually a few books in print already – if you’re interested in learning a bit more, you could try John Himmelman’s book Discovering Moths.